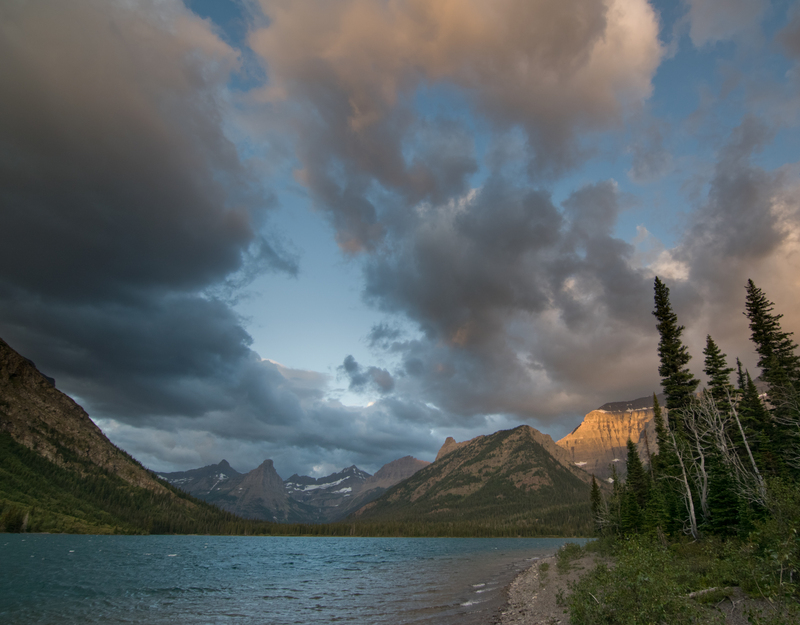 Earlier this month I had the chance to backpack the famous “North Circle Route” in Glacier NP with my wife and sister-in-law (who’s an awesome thru-hiker). We met a lot of awesome people and saw one of the most beautiful, alluring and inviting sections of mountains I’ve ever been too. Although the Rockies are not high in Glacier (tallest point is barely over 10k), they have some of the most singular beauty I’ve ever witnessed. They really make you want to stay and dwell. 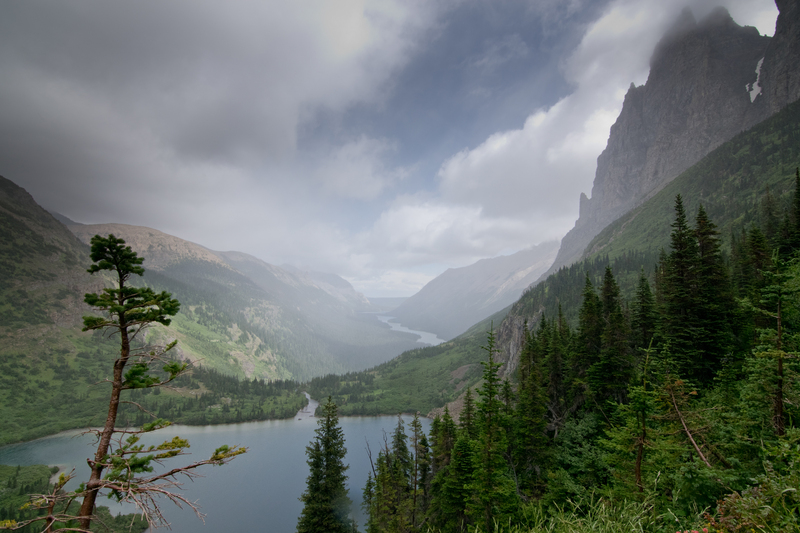 The walls of the Continental Divide were incredibly steep and dramatic, with thick, caky layers of black, ancient sedimentary rock, juxtaposed with achingly blue lakes and cirques constantly cloaked in glaciers melting out into countless waterfalls. 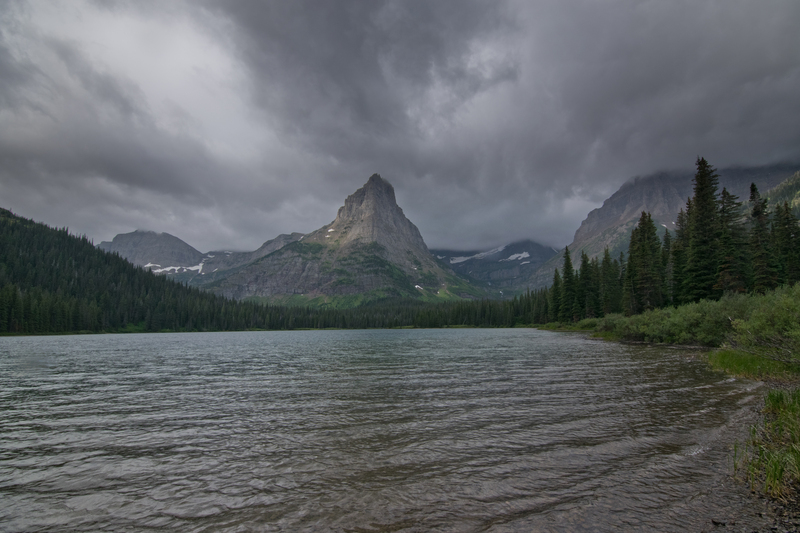 The North Circle Route is a well-known loop that circles counter-clockwise around the Continental Divide in the Many Glacier, Goat Haunt, Fifty Mountain and Logan Pass areas of the park. It’s the most sought-after route in the park and sadly designated camp-spots are a necessary in all but one small region (Nyack) of the park. It’s super competitive to get permits. I had gotten rejected for an advanced permit, so we decided to walk-up permits. We camped out front of the permit office at 3am, and there were already two groups in front of us. We were super lucky to get permits–it barely worked out. 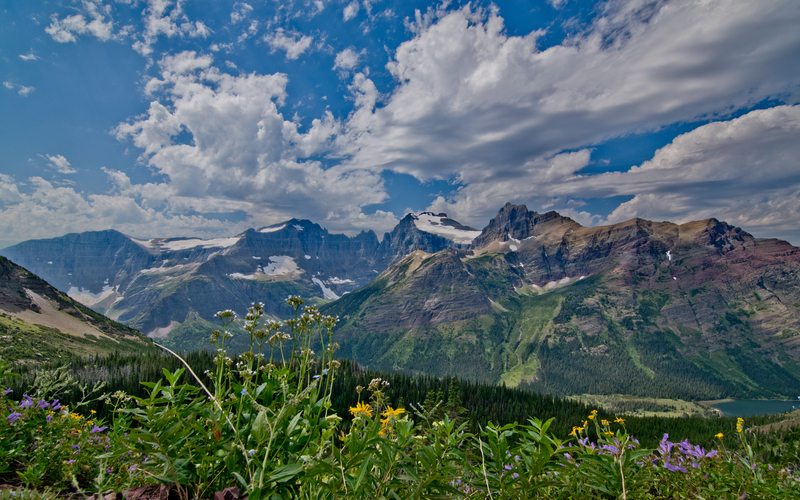 We did not get our first choice, which was to start out of Logan Pass and sleep the first night at Many Glacier. 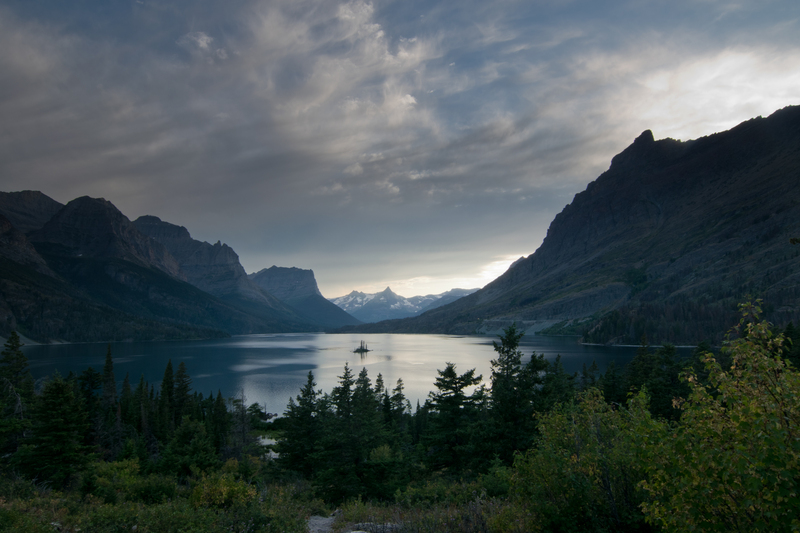 Instead, we got to start the next day out of Many Glacier and sleep the first night at Cosley Lake. 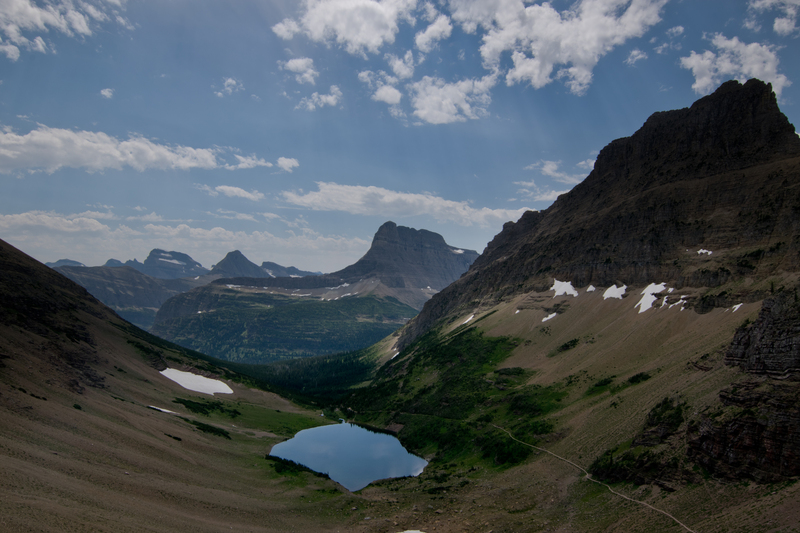 This was actually not a big deal, because the section starting out of Logan Pass is hikeable as a day-hike (Highline Trail) so we just did that first, and still got to cover all 70 or so miles of trail that I was planning on. I was planning to include this section as the first day of our backpacking loop. However, as mentioned, we couldn’t get the right permit for it, so we ended up doing it as a day hike instead. It’s the premier day-hike in the park, so expect to see a lot of people. However, it’s probably the single greatest day-hike I’ve ever done in my life. The views are constant. The wildflowers were the best I’ve ever seen, anywhere. 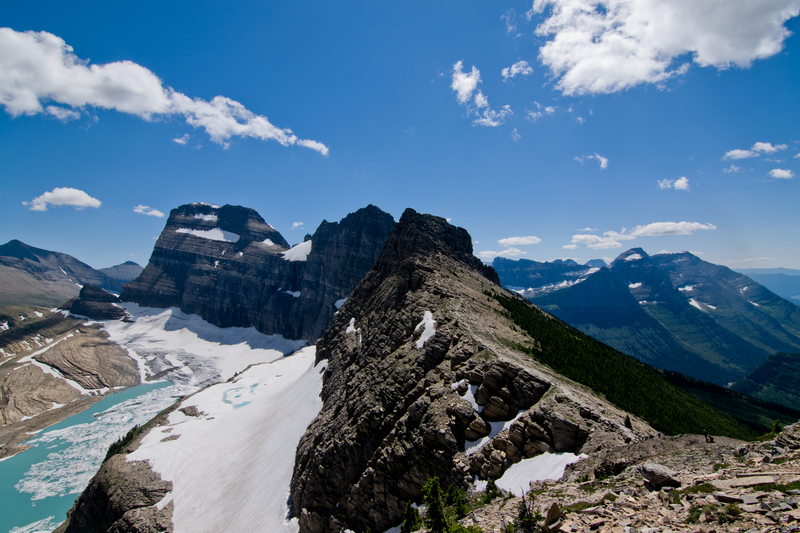 The extra spur trail up to the Grinnell Glacier Overlook is one of the coolest vistas that I’ve ever seen. 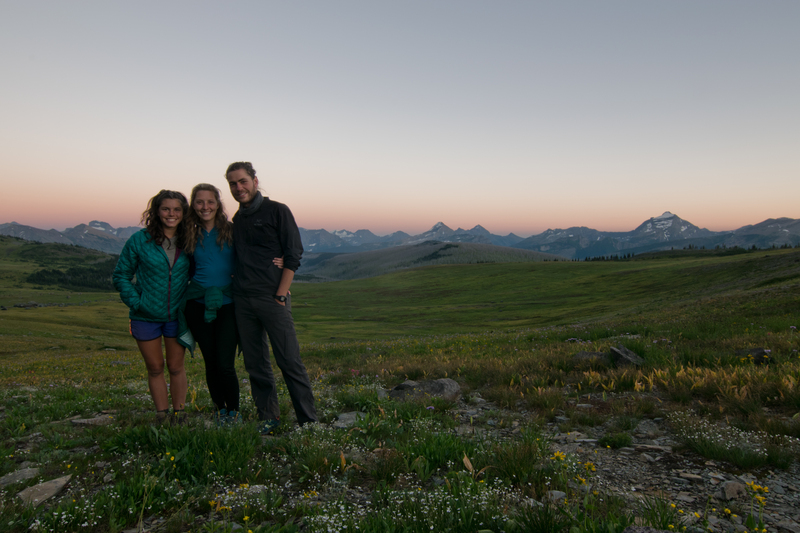 We parked our car at “The Loop” and then hitchhiked up to Logan Pass (all the shuttles were full). We parked the car at the Swiftcurrent Motor Inn and hit the Ptarmigan TH. This was the first day of officially backpacking. It felt really good to get into the backcountry. We saw a lot of day hikers all the way up to the Ptarmigan Tunnel, but after that it was only the occasional backpacker. Finally got some solitude. The climb up to the Ptarmigan Tunnel was our pass of the day, and it was super mellow going on the switchbacks. The weather was perfect and we got to see a herd of bighorn sheep on the way up. 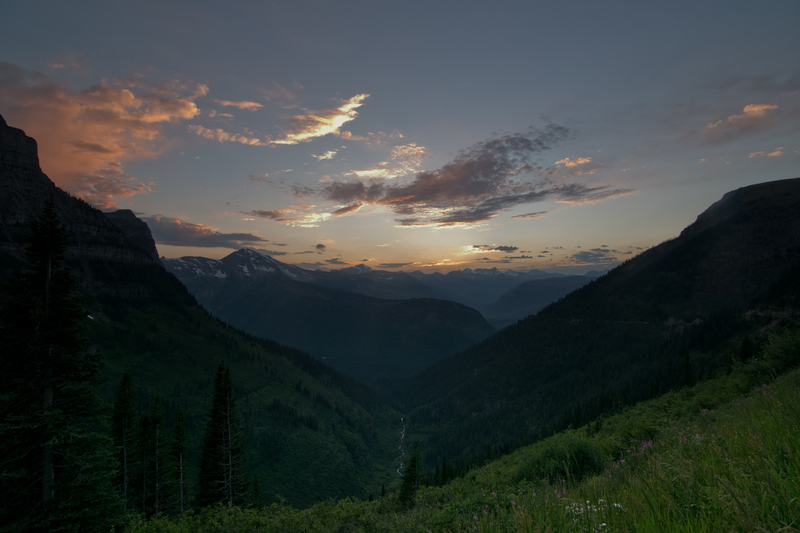 After you pass through the tunnel, the view opens up of the Continental Divide with a dramatic series of cirques and bowls to the west and one of the most stunning valleys in the entire park. Might have been my favorite moment from the whole trip. This day was rain all day. From early morning until dinner time. However, we made the best of it and actually had a blast. Needless to say, there were the most dramatic clouds of the trip on this day. The sunrise over Cosley Lake was especially breathtaking. We hiked into the cloud cover that was hanging down over the Divide the whole day. 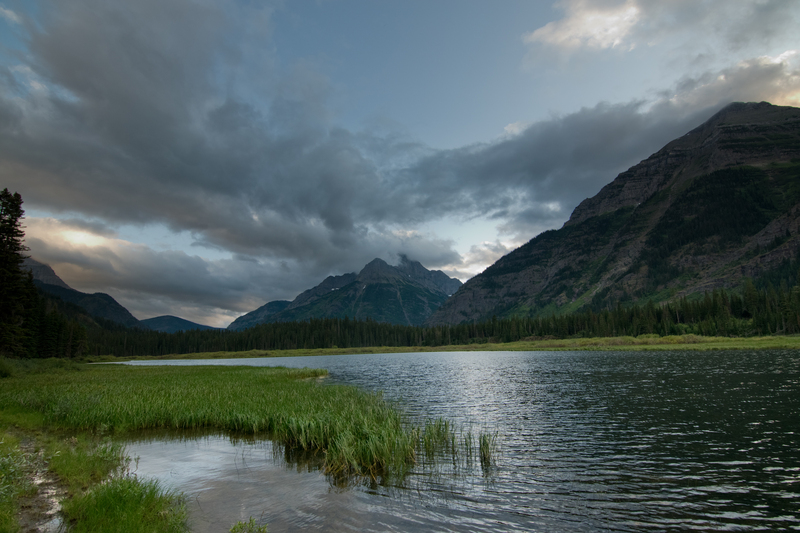 We hiked west through the dramatic valley of lakes along the Stoney Indian Pass Trail, upwards towards the pass. It’s a very long, meandering climb. However, the grade is so pleasant, that the 2,600 ft of gain up to the pass goes remarkably smoothly. It ended up being really cool to see this terrain in the rain. This section of hiking up the Stoney Indian Pass had the most waterfalls of any section of the trip. As we continued upwards, there were constantly new bowls and cirques each with a half dozen glacier-fed waterfalls making ribbons down the cliff walls. The valley was incredibly verdant too, an indication of how much rainfall this particular area must get. It felt more like a jungle than a mountain range. After we got to the top of the pass, the rain abated a bit. We began a very long descent (losing everything we gained and more) down into the next valley. 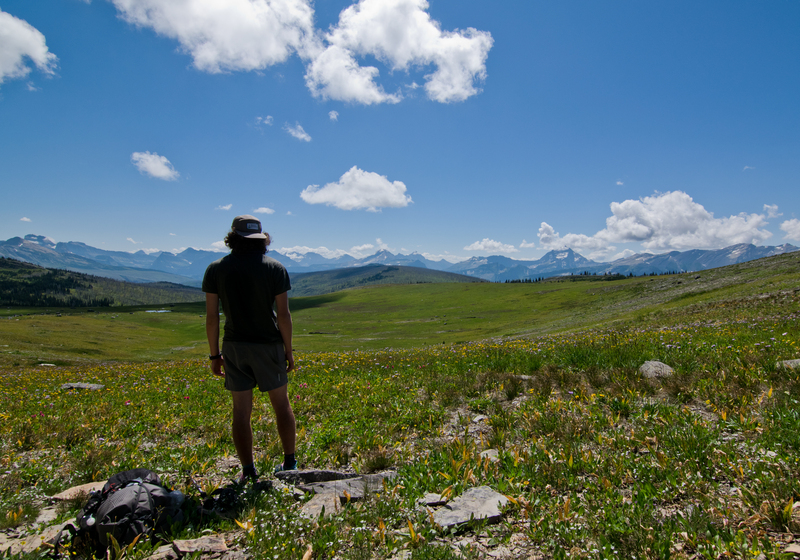 Once we reached valley floor, we briefly turned north up to the Kootenai Lakes. This was our northernmost part of the trip. 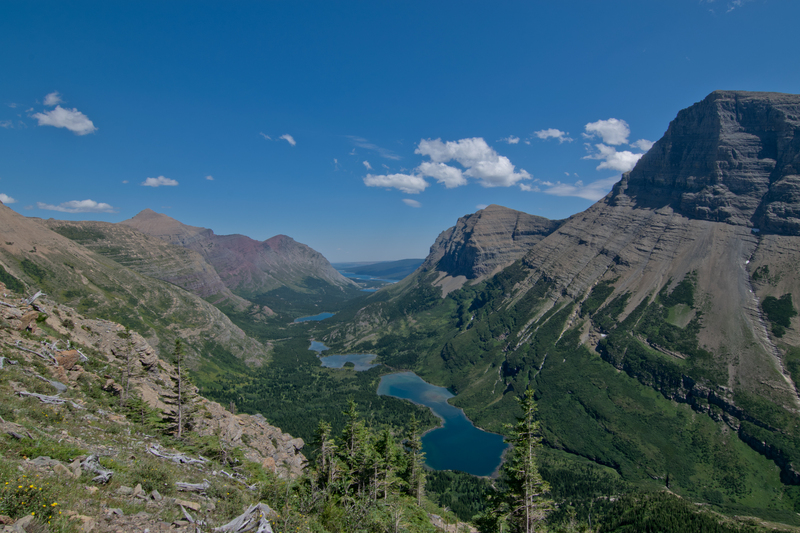 We were in the Goat Haunt/Waterton Valley area of the park and were just a short walk (only a few miles) away from the Canadian Border. Kootenai Lakes is incredibly peaceful, calm and meditative. It was the most relaxing spot on the trip. Plus it has the added bonus of being the premier spot for moose-viewing in the park. Apparently it’s the major breeding spot for the moose. We didn’t glimpse any moose that night, but we were woken up by a moose tromping by us in the middle of the night. And the next morning we got to watch a cow moose grazing along the lakeshore for a long time. One of the other campers even spotted her two calves. We bagan our southward leg of the loop here. This was our shortest day of backpacking, but it was hot and all uphill, so we were glad for an early finish. Plus, I was using old USGS topo maps, which indicated that the campsite was about a mile down the Flattop Mountain Trail. Turns out that the info was outdated. After about a mile through hot, burned-out, depressing hillside, we turned back to the junction and found the campsite on just the other side from the junction. Good lesson when using old topos. Most of the day was actually relatively ho-hum forest hillside scenery. However, when we finally finished our climbing for the day, we reached the top of the most beautiful passes of the trip. You immediately saw why it is called the Fifty Mountain area–mountains stretch, surrounding you, as far as the eye can see. Plus the top of the pass was a gorgeous, flat “sound-of-music” type meadow strewn with wildflowers and little tarns. We came back up to the pass to watch the sunset over the mountains that night. We got an early start because we had our longest day of the trip ahead of us–20 miles to finish back at the car. Luckily, this was the overall the most mellow and awesome trail of the trip. We were southbound back on the Highline Trail once again. 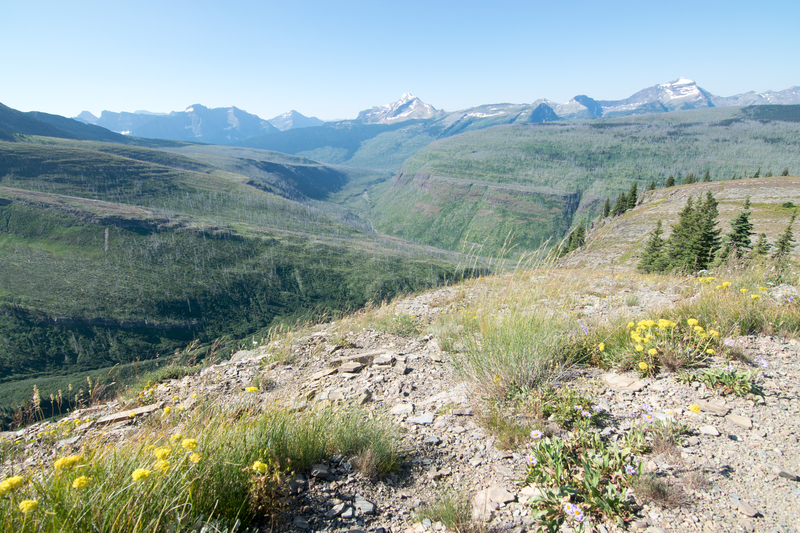 Unlike other trails, the Highline Trail stays true to its name: rather than diverting far down into valleys and then climbing back up passes, it simply contours the western face of the continental divide, staying very high up and losing little elevation. Like the first day, there is no ho-hum scenery–it’s world-class views the entire time. After knocking out the first 12 miles, we arrived back at the Granite Park Chalet which we had seen on the first day from the Highline Trail. Here, we made our final turn of the trip, turning eastward to get back to our car. 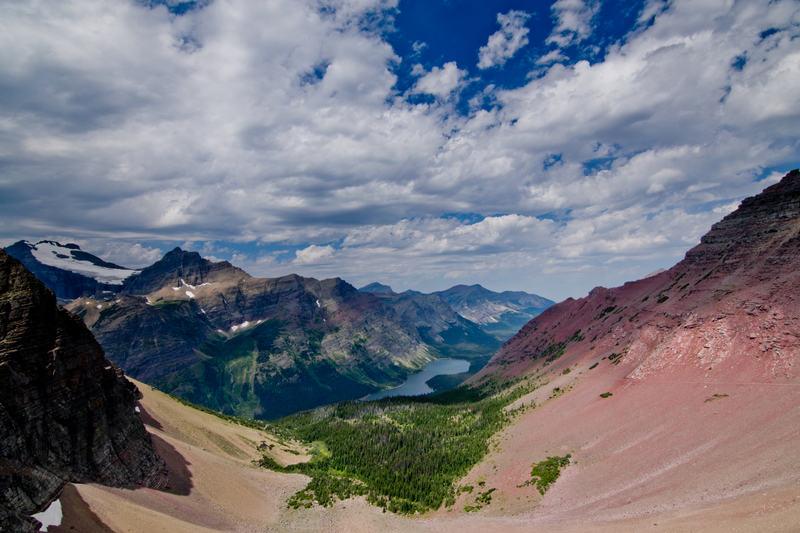 We went up over Swiftcurrent Pass before beginning a long descent down the absolutely gorgeous Swiftcurrent Valley. It was a fitting end to the backpacking. We finished at about 4:30. Luckily there were showers at the Swiftcurrent Inn (amazing!) and a really delicious dinner at Nell’s Diner. We hit the road at around 7:00. We were kinda bummed that we had seen neither a Grizzly nor the iconic Mountain Goats of the park. To our surprise, we saw both on our final drive back through park. To cap it off, we drove through one of the most beautiful sunsets of the trip. Perfect way to end.